It was another busy weekend with action at the World Para Athletics Championships, European U20 Championships, the Commonwealth Youth Games and a Diamond League, but it was quieter away from the major events. Marc Scott was inside the standard in a different race, however, as he clocked a PB of 13:22.37 in fourth place. “13:22.37!!!! World Standard✅ ,” he wrote on Twitter. Charlie Grice was 12th in the 1500m in 3:39.52. Harry Aikines-Aryeetey won a 100m race in 10.25 ahead of Joel Fearon. Jamaican women had plenty of success. Natasha Morrison won one of the 100m races in 11.19 and Anneisha McLaughlin-Whilby won the 400m in 51.91. Rhonda Whyte won the 400m hurdles in 54.96 with Britain’s Meghan Beesley agonisingly just missing the World Championships standard of 56.10 with her season’s best 56.14 in second. Demish Gaye was another Jamaican winner taking the 400m by over a second in 45.29. Niall Flannery set a season’s best of 49.74 in winning the 400m hurdles from Sebastian Rodger’s 49.82. Nick Miller won the hammer with a throw of 76.18m. 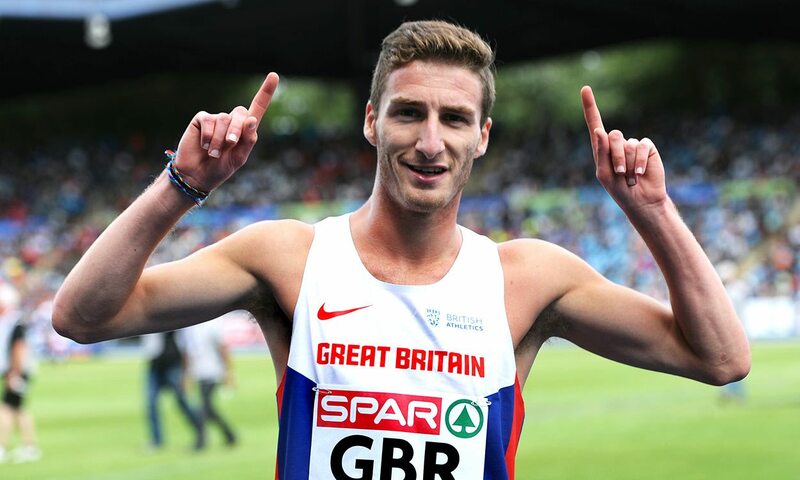 Guernsey’s Alastair Chalmers was among the winners on the final day of the Games as he clocked 51.22 for a British under-18 record to get 400m hurdles gold ahead of England’s Seamus Derbyshire. Aaron Sexton of Northern Ireland took 200m gold in 21.57, as bronze went to England’s Chad Miller, while Northern Ireland also got gold through Sommer Lecky with 1.83m in the high jump. There was a silver medal in the mixed 4x200m relay as Miller, Vera Chinedu, Sam Bennett and Georgina Adam ran 1.31.77 behind the winning team from the Bahamas, with Scotland fourth. In the mixed 4x400m another silver was claimed by England as Alex Botterill, Amber Anning, Emma Alderson and Josh Faulds combined to clock 3.25.45 behind Australia. Australia also won the mixed 4x100m in 43.19. While Germany’s women broke the world under-20 4x100m record in Grosseto over the weekend, a US quartet improved the men’s world under-20 4x400m mark with 3:00.30 in Trujillo. Josephus Lyles, Zachary Shinnick, Brian Herron and Sean Hooper combined to break a record which had been set by another US team in 2004. Anita Wlodarczyk threw a world hammer lead of 80.79m for the fifth best ever mark behind her own top four performances. Phil Wicks won by two minutes in a time of 30:37. Georgie Bruinvels was first woman in 35:22. Perri Shakes-Drayton won the 400m in 52.72. Sarah McDonald won the women’s 800m in 2:02.5.